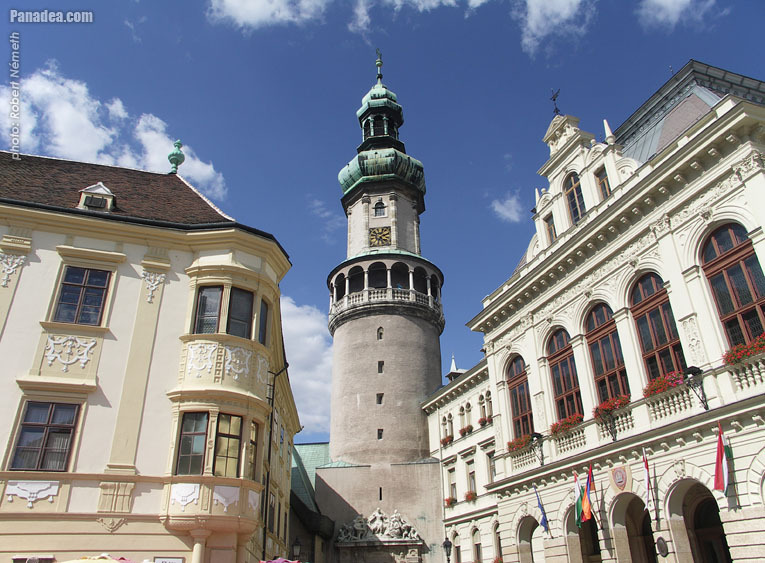 The streets of Sopron fuse the atmosphere of the Middle Ages and the Baroque into one mixture. The six or seven hundred year old houses are still occupied as in the past. Having a rest on some steps, you will surely be lost in reveries of bygone times, when reading the writings on the walls. Each house, in the inner city which is surrounded by a castle wall, bears memories of itself. The city was a favourite place of aristocratic families, for which the large number of palaces is a good example. Its narrow streets are the key to its atmosphere. Both the sub-alpine climate and the proximity of Lake Fertő make it an attractive place for visitors. The city takes pride in its thousands of years old history. In the beginning of the 1st century the Romans founded a city under the name of Scarbantia on the site of the present inner city. The famous Roman commercial route, the Amber Road, used to pass by. When the old castle wall was completed around the 9th or 11th centuries, the construction of the castle was finished as well. This was the time for the city to get its Hungarian name after the overseer called Suprun. Ottokar II, a Czech king, invaded the castle by treachery and took the children of aristocrats with him. 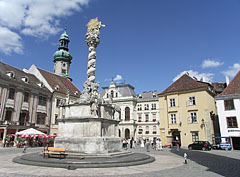 In 1277 Sopron opened its gates to László IV, king of Hungary, who managed to recapture the city. For this he made it a free royal town. As for the lovers of wine, they must taste the Kékfrankos of Sopron. According to oral traditions in the years of Napoleon’s reign this outstanding wine was sold to French officers, who paid with blue franc. This is where the name comes from. In 1921 the city was awarded the title of Civitas Fidelissima, the most loyal city. It was decided by referendum that the population did not want to be attached to Austria, but to belong to Hungary in the future. To understand the importance of this fact it must be known that after World War I, in 1920 the Trianon peace talks resulted in a shocking decision even for the European public. Out of all the countries Hungary received the worst punishment; even although it did not have any role in provoking the war. Two thirds of the area of Hungary was detached to the neighbouring countries, this way several million Hungarians were trapped on the other side of the border, mainly in Romania and Slovakia. As a result of this Hungary is the only country of the world which is surrounded by itself. 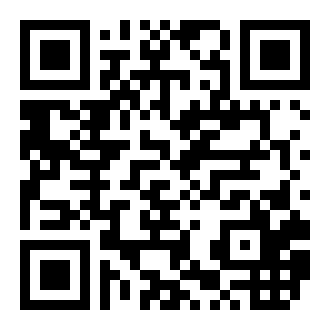 The strange circumstances of Trianon are still being examined by historians. Two buildings in the square must be mentioned. One of them is the Dominican Church and Monastery from 1745; and the other one is the Széchenyi Castle from 1851. Starting from here you can arrive at Orsolya Square. On the former Salt-Market (Só-piac) of Orsolya Square we find the Orsolya Church with the nunnery and a school built in 1864 in Romantic style. 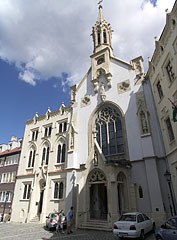 The Roman Catholic Collection of Ecclesiastical Art is located on the square. On the opposite side there are other sights, the Lovasház building from the 16th century, and the Cézár-House in Hátsó-kapu Street. We can commence on our way from here in the direction of Main Square. 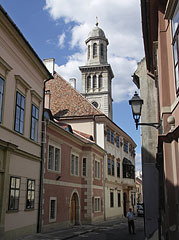 The unique synagogue, even measured by European standards, is located in the oldest street of the city, in Új Street. Before 1440 the street used to be called Jewish Street, since mainly Jews lived here. In 1526 they had to leave the place because they were believed to have cooperated with the Turks. In those times 16 simple houses formed the street, they were owned by less well-to-do families. Only one Jew named Izrael became famous, when, in the 14th century, he moved to Vienna and became the secretary to the Habsburg prince. The 900 hundred year old synagogue was built on a lower level. There was an order decreeing that synagogues could not be built on the same level as other houses, so they had to be sunk. 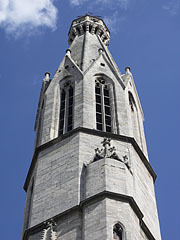 The most prominent building of the square is the Town or Fire Tower. It was built on Roman foundations at the end of the 13th century. It received its present shape after the great fire of 1676. 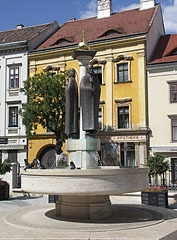 Its side facing the Square is called Hűségkapu (The Gate of Loyalty), which is a memento of the referendum of 1921, when the population voted to belong to Hungary. The City Hall is situated on the right side of the tower, and Storno House is on the left. 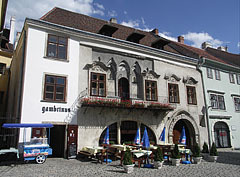 The Storno House, which is one of the most beautiful palaces of Main Square, already existed in the 15th century; furthermore Matthias Corvinus stayed here. Its present shape from the 18th century is the result of the work of Ferenc Storno, and inside the rich and valuable private collection of the Storno Family can also be visited. The church was built in 1280 in Gothic Roman style. 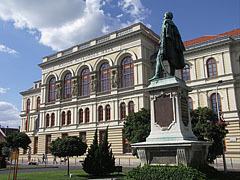 It used to be the location for coronations and the parliament in the 18th century. The most valuable piece of the interior from the 18th century is a carved wooden pulpit in Rococo style.